Experience at the top. Excellence throughout. 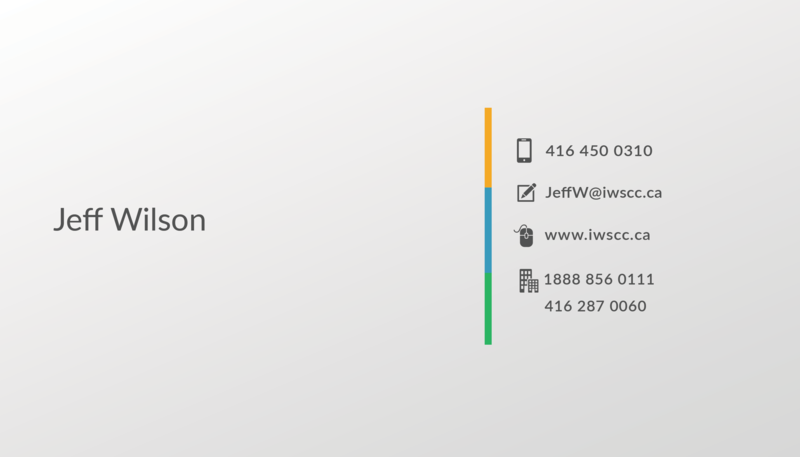 IWSCC is co-led by Deidre Guy and Jeff Wilson, both with a long history of management and start-up experience. As Founder and CEO of Adaptability Canada, Jeff Wilson is at the forefront of inclusive design thinking. Jeff created Adaptability Canada to improve the built environment for Canadians at home, at work and in the community. Within a few short years, Adaptability Canada has attracted a number of large national and provincial clients. Prior to Adaptability Canada, Mr. Wilson spent more than fifteen successful years working with many leading global B2B and B2C enterprises to significantly improve their customer experience and how they attract, engage and retain customers. His business experience includes customer experience and universal design, strategic consulting and creating and managing global marketing programs for his clients, as well as founding and managing numerous entrepreneurial enterprises. Deidre is a highly effective communications and project management expert recruited as part of Adaptability Canada’s commitment to delivery excellence. Prior to joining Adaptability Canada, Deidre held senior management positions at a number of Canada’s large security firms leading client teams to successfully grow business year over year while driving higher levels of customer satisfaction in all service contracts. With more than 25 years of sales and project management experience, Deidre Guy brings a broad range of project and client management experience to Adaptability Canada. As a senior team member, Deidre is involved in all aspects of management of the company with a focus on client delivery. A strong leader with adept organizational qualities and provides a high level of reliability in all undertakings. Deidre is Founding President of the Inclusive Workplace and Supply Council of Canada, – a non-profit certifying organization that promotes businesses owned by persons with disabilities and/or Veterans. Within the IWSCC, Deidre supports business development of Canadian corporations, strategic partnerships, and supplier outreach. Don Huff is an opinion leader and leading strategist in the environment, social change and built environment. He is well known and respected for his insightful analysis and ability to rapidly translate this into a persuasive and winning campaign. Such campaigns reflect years of practical experience, media and government relations expertise, technical knowledge, and a deep understanding of the wide range of audiences that need to be influenced. ECO Strategy’s client base is a combination of trade associations, non-governmental organizations and businesses with a green building or energy conservation focus, and First Nations. Clients engage ECO strategy in response to an enviable record of success in delivering focused, cost effective campaigns, often focused on outreach efforts in ethnic, First Nation, rural and northern communities. These campaigns are informed by significant experience with the design, promotion and delivery of persuasive messages to promote energy conservation incentive programs. Social media tactics and incorporating multilingual approaches are embraced. Each targeted campaign is backed up by focused delivery and an emphasis on earned media tactics, including media conferences and events with media appeal. ECO Strategy has written, distributed and placed thousands of media advisories, releases and opinion pieces. ECO Strategy’s media relations work has been covered in the media in every continent, including the Antarctic. Veronica is a highly effective communications specialist and outreach coordinator with a deep-set belief that practicing equality means actively working to change the way we think and work to ensure inclusion of those who are systemically disadvantaged. Veronica holds a masters degree in anthropology and has conducted research internationally with the aim of hearing and designing for those in marginalized situations. Prior to working at IWSCC, she interned at strategic consultancies that applied a “customer experience first” approach to strategic and service design. She is passionate about designing for and supporting marginalized communities and is keen to work with Diverse Suppliers and push for the creation of processes and environments that practice inclusion. Adrienne started working at Adaptability Canada in 2016 as junior analyst and site auditor. She learned to consult the Ontario Building Code (OBC) and Accessibility for Ontarians with Disabilities Act (AODA) to evaluate accessibility standards and make recommendations to maximize consumer comfort. She moved into her current position as Account Executive in 2018 and was given the opportunity to reach out to property managers and other champions of accessibility to expand and enhance accessible environments through collaboration both during and after builds. She recently started with the IWSCC and is thrilled to be part of an incredible team working towards increasing inclusivity in the corporate, public, and government sectors. Adrienne’s degree in Anthropology reflects her passion for understanding and working with people of all cultures and her appreciation for the value of diversity. Adrienne is bilingual and is hoping to become multilingual, as she attends American Sign Language classes, and will continue to pursue different avenues and education in support of her desire to remove physical and social barriers to accessibility both locally and nationally.